therefore I opted for a 14k gold & silver mix on two of the charms and one with Swarovski Crystals and Sterling 925 Silver. Now on an emotional level, I need lots of luck nowadays since some changes are ahead with my job life. I even went ahead and purchased a bamboo a few months ago. 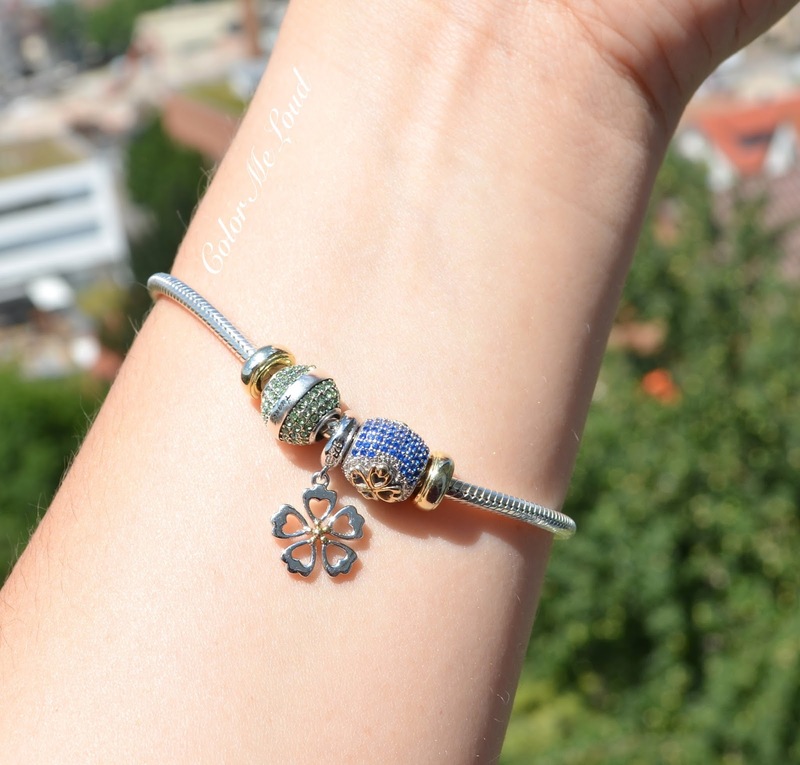 So I thought, I should pick as many clovers as I can for the bracelet to supposedly bring more luck. I am usually not very superstitious but since all I can do is nothing else but to wait right now, I am trying to keep the positivity and assure that the bracelet is going to take care of that *winks*. How rational of me right? The blue/gold and silver/gold clover charms are a mix of gold and silver. The third green one is my birth stone. It has green Swarovski elements on silver and on silver "August" is written. I opted for two gold-plated stoppers on each side. After using the bracelet for a few weeks now, I know this was the best decision ever. When you open and close the bracelet, without these your precious charms may fall down. On a side note, mine fell down straight on the hard surface and bounced all the way down the stairs before I placed my stoppers. None of the stones were lost. So thumbs up for the quality here. These come in very cute cream white boxes with leather surface and baby blue ribbons as shown on the first photo above. 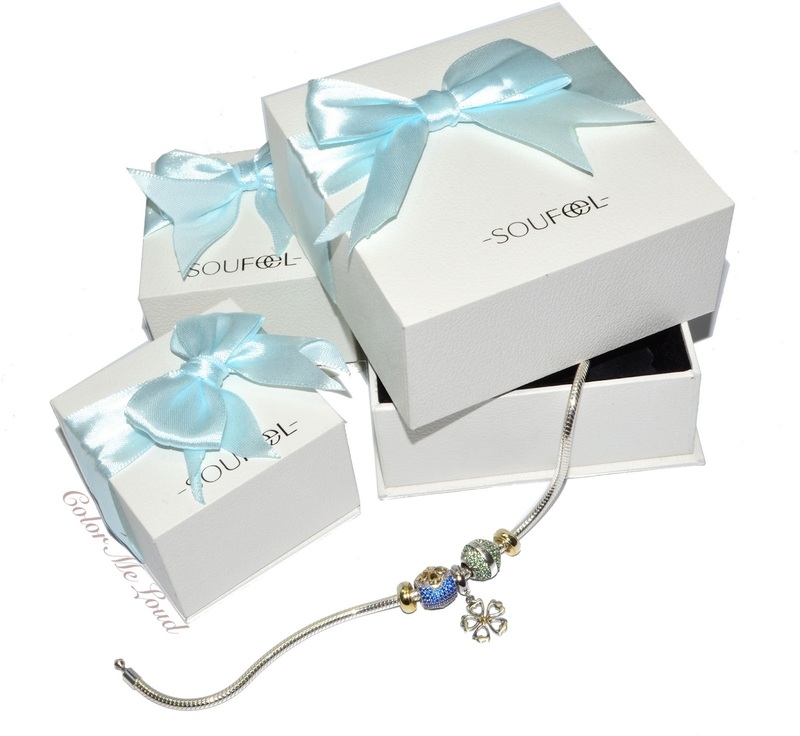 Each charm comes in a separate box which is great if you want to give it as a gift. A few more tips from me, after measuring your ankle, you have to add 1-2 cm for the charms to fit. I measured my ankle to be 18.5 cm and ordered the bracelet 21 cm. It was a little too loose but I know I will add more charms in the future, so no regrets there. 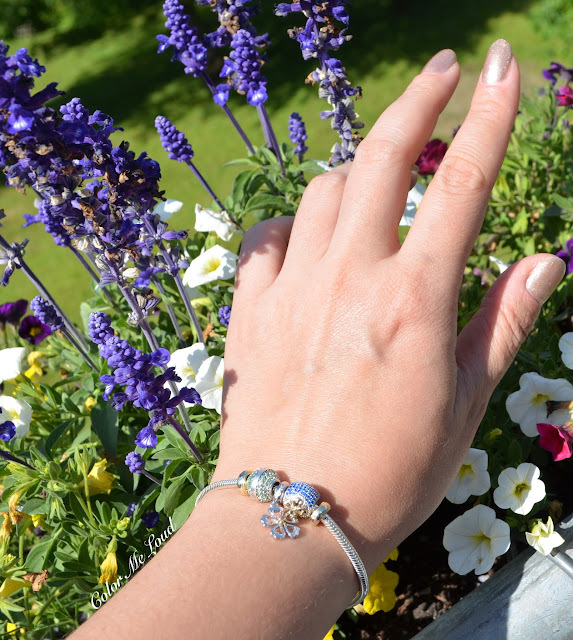 The closure of the bracelet is easy to open and close with one hand and it is very secure. The charms have high quality, all the stones are aligned perfectly and the material is processed with precision. All in all I am really convinced with these. I am usually skeptical when an online store reaches out to me. Some time ago I had a rather unpleasant experience, I was sent some bad-quality sunglasses which I didn't want to feature in the blog. This time I am very glad that these charms turned out to be something I can recommend further. One more thing that I love: online store offers worldwide free shipping for the orders over $50 and 365-day return and exchange guarantee. Are you intrigued? Soufeel generously offers one of my readers a gift card of $100 value. Give away is open internationally and will be active for two weeks. I also recently launched my Facebook page and I am grateful for each and every support, so I would be thankful if you visit me there. Hoping my clovers bring some luck to you too! Oh and if you don't want to wait for the give-away and give it a go, Soufeel offers 5% discount for you with coupon code Sara5 (I am not affiliated with that offer). Final thoughts: How did I miss all the fun with charms until now? My experience with Soufeel has been all positive, from order to the delivery, which arrive in a week although I was told it could take longer. Packaging is very pretty and handy if you want to give it as a gift. The processing of the charms and the bracelet is top quality. These are also more affordable than some other charm providers out there, so highly recommended. I am eyeing that charm with the lipstick right after that one. Oh and the one with the microphone maybe. I ended up having a long wish list. Hope you enjoyed this post and the give away. Have a wonderful Sunday, see you tomorrow. Disclaimer: The product in this post was provided free of charge for my consideration. The gift card for the give-away is also provided free of charge. Regardless all opinions are honest and my own. I am not paid for this review nor the give-away. I got a charm bracelet and beads ages ago, before the Pandora craze. Later I got another one with the dangling, clip on charms. I think I need to dig them out. The Austrian Crystal Taper Necklace is lovely, and I love the Gold primrose pendant. I really like the green vine charm as well. Love your picks Sara, and good luck with that job-thingy! I like the dolphin bay bangle charm, jungle owl charm, green pear blossom murano glass bead,and the soufeel crystal heart charm. Your bracelet is very pretty and wishing you luck with your job situation-- so nerve wracking. I like the starfish and the green leaf and actually anything too delicate doesn't usually work on me but you never know. Are you a Leo or a Virgo? Oh that is really pretty!!! I wonder how is it compared to Pandora.... everybody here is crazy about Pandora and it's so expensive. *shakes head* All the best of luck, Sara!! PS: Bamboo is bad luck supposedly i think? Your bracelet is gorgeous. I love how dainty it is when its not overcrowded with charms. I hope your job sorts itself out, its always really stressful when you have no control over something that is so integral in life. I love the leather bracelet , the four leaf clover charm, and the flower charm! Gorgeous! I love charm bracelets like these, I love my Pandora bracelet too and I love that every charm means something to me and it's a memory. Soufeel products look beautiful- I love the Dazzling Flower Collection! My three favorites are 1. I love the Pink Cubic Zirconia Couple Rings, and the Austrian Crystal Heart Knot Necklace, and Austrian Crystal Heart Knot Stud Earrings. Thanks so much for the opportunity! Hope your charms work :) I like the Austrian Crystal Butterfly Lavender Necklace, the Gold Autumn Dangle, and the Pink Waterdrops. 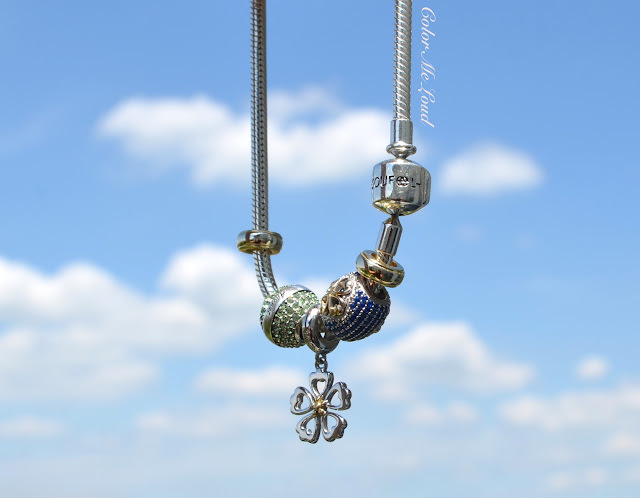 I love the owl charm, the peacock charm, and the Waves and Beach Faceted Murano Glass Bead. I don't own a charm bracelet, but I definitely like yours, it's pretty :-) And I love jewelry with a meaning. Good luck to everyone who is entering the giveaway. And good luck with the job! Thanks for the luck Agata. Dazzling Flower, yes, that is my favorite as well! Yes waiting was hard but now I have good news, more about it soon. I don't own a Pandora bracelet but from what I see in the store, these are very comparable. I am not sure if one can tell the difference actually. Luck worked with the job, hoping to start as soon as September. I love the mullet pendant charm, the industrious bee, and the folklore murano glass bed. Thanks!! Ooh, I like the pink murano glass bead, the sea blue ice crystal murano bead, and the clover charm. Congrats on the new job!! Oh wow, there's so so many cute things, love the sea star, primrose earrings and the orange red whirlpool ring! There are so many! I really like the lucky cat charm necklace, the Phoenix ear studs and the amethyst ring!